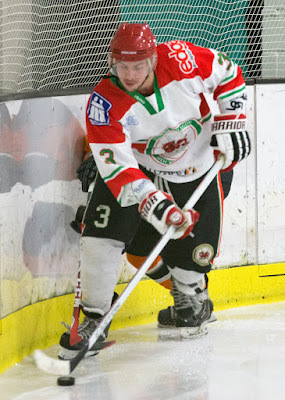 Defenceman Mike Jones will make a welcome return to The Dragons next season – the latest home-grown star to agree terms with Head Coach Lol Paul. The 27-year-old has spent the majority of his senior career with the Flintshire outfit, apart from short spells in Turkey, Invicta and at Telford. He joins a Chester Road rearguard that already boasts the defensive talents of Matt Wainwright, Steve Fellows, Bryn Roberts and Marc Lovell. And for Paul, a strong line-up at the back gives him extra choice in choosing goalscorers, ahead of the new Laidler Conference season. He said: “Mike Jones is a player who has always been a rock for us, and adds stability to an already strong defence. Again, he displays total commitment in games. “Money can’t buy that sort of attitude, so I had no hesitations in bringing him back. Mike forms great partnerships with whoever he’s playing alongside in defence. Paul’s summer transfer policy has already caused waves across the NIHL, after Wainwright and Filip Supa signed from rivals Widnes Wild. That bid for quality is set to continue throughout the off-season, as the Dragons chief assembles a roster capable of challenging for honours. He added: “We are talking to a number of players, who have been great servants of this club. I want to keep that local link to The Dragons. “But I have also got my eye on several new guys, including an import who will be a real statement of intent in this league. I want to build an absolutely lethal line-up of forwards.